"The most unorthodox club in the world and the most sporting. May it ever remain so", wrote Charles Turley Smith, one of the founding fathers. It can only be Mullion in Cornwall.... where even the Adders' are charming. There is a train of thought which suggests that the further one travels north in England, the friendlier the natives become. Although this may arguably be true in many respects, there remains one anomaly to the theory. Sharing more in common with areas of Lancashire and Yorkshire than the affluent Home Counties, Cornwall and it's inhabitants are welcoming and amiable. In golfing terms this is no more perfectly illustrated than at Mullion Golf Course, the most southerly course in Britain. From the moment you arrive in the car park and find expensive luxury vehicles alongside more "economical" modes of transport, there is an air of relaxation which remains with you throughout your stay. All preconceptions of the nonsensical elitist element - which can be so damaging to our game - are blown away. 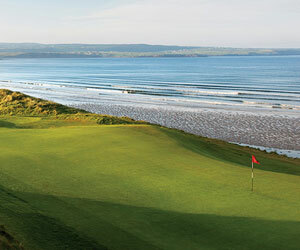 Although you are not initially aware of your close proximity to the sea, this appears to be a classic links course. There is no doubt that the members are thoroughly proud of their hallowed ground, and so they should be. Indeed, this course has been a source of great pride to it's patrons since it was established in 1895 and much loved by literary luminaries such as Sir Arthur Conan Doyle (Sherlock Holmes), A. A. Milne (Winnie the Pooh), Sir James Barrie (Peter Pan), and Compton Mackenzie (Whiskey Galore). The first port-of-call at Mullion must be the excellent pro's shop. It is from here that you can book a session at the superb on-site computerized golfing academy, invaluable as much after your round than before, and find out just why you've developed that annoying hook. Half-an-hour's tuition with head-pro Phil Blundell, or U.S. Tour experienced Chip Sadler, may turn out to be the best money that you ever spend and cannot be recommended highly enough. Armed with your new improved swing, you can head to the tee in confidence. The 1st breaks you in to the course easily. A straight and simple 199-yard par 3 seemingly presents no problems, but it is secretly giving you a false sense of security before a more stern test of your golfing ability begins. The 2nd 370-yard par 4 is a blind hole, simply by virtue of a small hillock over which an unwavering drive is crucial. That achieved, the route to the pin is impeded only by a few small bunkers which a novice may find a little daunting, but should be no cause for concern for the lower handicap player. It is only at the 3rd tee that you fully appreciate how spectacular the position of this course is. Whilst you may be concerned with accurately driving onto the relatively narrow fairway, you will be equally impressed with the views over the Atlantic Ocean across which the next landfall is Newfoundland. Indeed, the changeable conditions which this vast expanse of water affords is one of Mullion's greatest assets. On a hot, calm summer's day, your game will differ immeasurably from that beset by a violent storm - but be equally rewarding. Whilst driving into the teeth of a gale on the 3rd may mean a hard slog to the green 400 yards away, the 4th benefits from wind-assistance. And you need it. Just shy of 500 yards in length, there is only one way into the green where avoidance of a cluster of bunkers to the right is essential. Land in one and you'll spend the next hour hacking into the next.... and the next. The 5th is perplexing. Though a good drive will have you confident of reaching the green in two, the large mound which guards it demands careful club selection. Too little will find you lodged in the thick rough which fronts it, too much and you'll overshoot drastically. Or, you could land your beloved Balata in the hidden irrigation lake and lose all sense of self-control. You have been warned. Put your troubles behind you, because Mullion is about to prove exactly how special it is. The 6th is undoubtedly one of the best holes I have ever played. From an elevated tee, the green is 300 yards away and over one hundred feet below. The stream to the right marks the out-of-bounds, and the thick vegetation on the steep slope to the left is to be avoided at all costs. However, a wayward shot is the least of your problems. If you have hired a buggy you can expect a "white knuckle ride" down the slope which is capable of causing nervous indigestion at the very least. Indeed, just when you believe your troubles to be over, you are greeted by numerous signs which comfortingly warn of Adders - Britain's only venomous snake. But worry not, very few ever see these timid beasts which politely slither away before your arrival. Now prepare to make or break your round. The 7th is, according to Chip Sadler, the most difficult hole on the course. I agree wholeheartedly. If you can par this 430-yard test of accuracy you should be inaugurated into a hall-of-fame. Whether you succeed or not, you will at least enjoy the beautiful sight of the 14th-century church nestled into the corner of the beach. In fact, why not pause and spend a little time searching for gold coins which are washed up from the wreck of a Spanish Galleon at nearby Dollar Cove - find one and it will more than pay for your day out! The short par-3 8th poses no real problems, except for a ring of deep bunkers which you could lose a grown adult in. Alas, the same thing cannot be said for the ninth which appears to be so steep as to require crampons for the ascent. In fact, I'm sure that there is a marked difference in oxygen levels from top to bottom - ending up breathless even before I return the driver to the bag. Fortunately it isn't quite as formidable as it first seems, but a carefully placed drive is essential in order to avoid ending up thrashing furiously from the valley alongside. The back nine begins with another tee elevated way above the green 390 yards away. This 10th hole not only suffers from thick rough on either side of the erratic descent, but also by a deep World War II bomb-crater guarding the green. The 11th is another short par-3 which punishes should you not make the green with your first shot, whilst the dog-leg left of the twelfth brings you back up the hill. The remainder of your game is played along less hilly terrain than before - much to the relief of weary calf muscles. After tackling the relatively straightforward 340 yards par 4 13th, you will find yourself driving towards the 14th green which sits on the cliff edge, high above the swirling water below. This is another of Mullion's more difficult holes and requires a strong tee-shot for any form of success to be guaranteed. A stone's throw from the spot where Marconi sent the first transatlantic radio signal, the 400 yards 15th is another hole which benefits from the strong westerly winds, whilst the tiny par 3 16th is nestled snugly into a corner away from the worst of the elements. The 17th and 18th are both par 4, and best played according to the chip & run ethos and provide a fitting end to the full 6,037 yards par 70. Mullion is undoubtedly as enjoyable for the novice as for the low-handicapper. But this is not an easy course - Peter Alliss's record 68 is testament to that fact. However, it would be hard to have a disastrous day here, and even if one were to do so it would be impossible to criticize its beauty. Whatever your score, finish your day with some of the great fare on offer in the clubhouse (where a friendly reception is guaranteed to all visiting golfers). But one word of warning: if you should look through the window and see Pooh, Piglet, Sherlock, and Captain Hook teeing-off their mixed foursomes..... it probably means you've had one drink too many. £25 weekend, £20 weekday. Handicap required.